My favorite pastime during my stay in the US was to glance through the weekly ads from various stores which landed at our doorstep and compare prices of same items in different stores – just for the heck of it. There was this rare pamphlet from Wal-Mart about a set of products at “Unbeatable prices that’ll make you sit up and take notice” which completely bowled me over! I tell you it did make me ‘sit up and read’ the details of the advertised products. One food product Friskies claims – “4 delicious varieties. Enticing aromas, appealing shapes, and delightful flavors. 100% complete nutrition, including essential fatty acids and antioxidants”. Another – ‘Whiskas’ – cries out “Assorted flavors. Special flavor-lock pouch seals in flavor and natural juices.” Mouth-watering stuff, eh? Next are the supplements –“Keep them young, energetic and sassy. With supplements that boost their health”. Sure, you’d say, why not – it’s great to be health-conscious?! (If I had to) I’d go for the one that advertised “Supports joint health and function. With vitamin C to promote healthy collagen growth. 60 tasty, chewable tablets.” Hm… sounds good. I’ve heard of toilet training but ‘Training pads’? The ad proclaims “10 times more absorbent than newspapers. Controls odors. Built-in scent encourages elimination on the pad”. Snort! What more will we invent? Well there are no diaper ads, but wipes, yes – ‘Fresh Step’ boasts of “Fresh, clean scent. Easy way to clean litter box and scoop”. Any guesses about the potential customers for these products? Now no prizes for guessing who the ads are directed at – yes, the ads are indeed about various pet products – some yummy treats and food for cats (Friskies, Whiskas, Special Kitty…), others especially for dogs (Pedigree, Nutrish, Ol Roy, Purina One…). Such a variety in food and health supplements – manufactured to health-and-nutrition-specifications - almost vying with those available for kids or adults!! I am bowled over by the variety of flavors and flavor-lock pouches, supplements and what not! Oh yes, there are also pet beds, toys… My pamphlet claims – “walmart.com/petscenter has great pet tips.” Visit our online Pets Center for toys, bedding, crates, and houses, plus supplies for fresh fish, wild birds, and other small pets. Pet Q & A answers many questions about nutrition and general healthcare, behavior, training, and living happily with your furry, feathered and finned friends.” Wow, new pet-owners must be thanking this site and visiting it at every emergency just as new parents still rush to Dr. Spock’s book or seek help online! 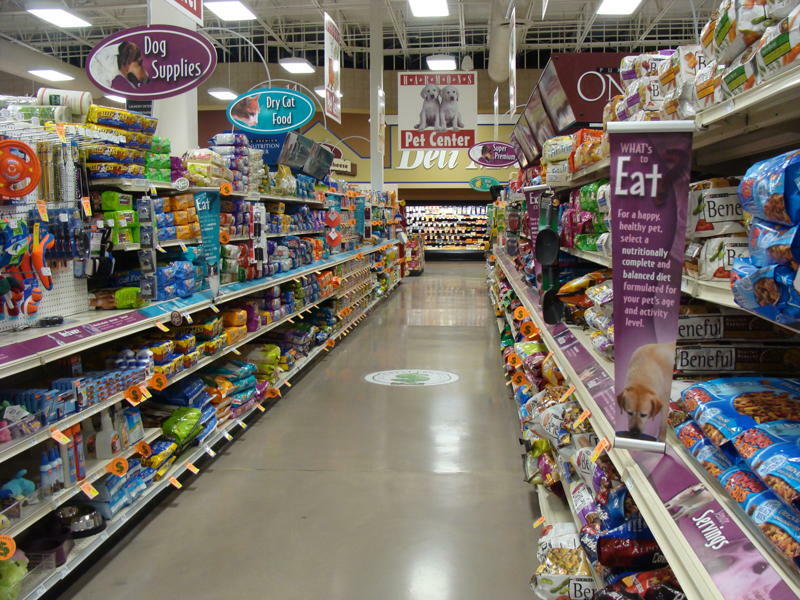 We see these ads on TV too – if I’m not mistaken, I’ve seen more commercials on pet products than baby products! 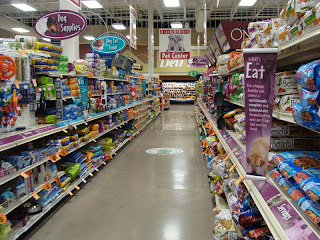 During my next visit to Wal-Mart, my kindled curiosity leads me to the aisles I used to skip earlier – the pet products aisles which have all those products advertised and more…. Soon I realize this is just the tip of the iceberg! There is a lot more to come – an array of unimaginable sophisticated products for pets. While flying back, as I was flipping the pages of ‘Sky Mall’ my eyes popped out on seeing some advertisements bound to catch the eye of indulgent pet-owners – more about them in a bit. Pets are adorable – no doubt – and they are family too. But how many of us in India stack special food for them? They’d fondly be offered what the family eats - with an occasional specialty dish cooked exclusively for them or recently introduced ‘pet’ food from the supermarket. Out there in the US, pets enjoy an enviable status – if there are no kids to compete for attention, they are the sole apple of their parents’ eye, even if the household has kids, no worry, as they have a unique status in the family. Imagine you get yourself a pet – a pup or a kitten. It is as if you have had/adopted a baby – you need to stack a rack with special food varieties, health supplements - you have seen the array of products flooding the market. You won’t stop with that –– just as you lovingly set up the baby’s room, you’d be happy to provide your pet with something more, something special - may be a little ‘house’ or a ‘zone’ with a special bed, cozy seat, plate-bowl & accessories for meal time, bath essentials, toys to keep them entertained… You can choose from some interesting products adorning the aisles of Wal-Mart – super/sofa scratcher / scratching post, oval/round cat basket/ ‘love bucket’/ lounger! Or dog products – dog toys/feeders, dog beds, collars & leashes, dog treats, breakfast bites, chew toys and pet taxis, dog apparels, sweaters, even accessories such as purses and hats / bows and ties – for the party-hoppers! So they can even boast of their own wardrobe collection! And even as you indulge yourself in identifying and improving their motor and mental skills as you play with them and remembering to keep the place pet-safe soon you will have the unenviable task of potty-training them. You can depend on Sky Mall products to help you out. A Comfy Couch with a bone-shaped pillow in various sizes for dogs of different sizes, or Indoor/Outdoor Dog Bed or tent is nothing unusual. But then there is ‘Neater Feeder’ useful for messy eaters to keep pet food and water spills separately collected for easy clean up or ‘Motion-activated alarm’ to train your pets to stay off your furniture or countertops or ‘Pup STEP Plus’ for pets needing help getting on to their favorite couch or bed – all of which are indeed unique! I realize that bringing up pets is no less than child-rearing! Potty training is a milestone and there are a range of indoor Restroom products ideal for high-rise dwelling dogs and cats – some simple – with an irresistible scent to draw your dog to a designated area of your yard or to the portable potty to relieve him while some are more sophisticated with pop-up sprinklers. The ‘Litter Robot’ for cats is a self-cleaning litter box, transferring waste into a trash bag for easy disposal so that you don’t have to use your gloves and scoop. But the piece de’ resistance is ‘Litter Kwitter 3 Step Cat Toilet Training System’ (including Step-by-step training DVD) ensuring that the cat will eventually use your regular toilet - claiming “Potty training your cat can be faster than most people can potty train their kids”. ( In that case won’t more people prefer pets!). As if all this is not enough, ‘The Canine Genealogy Kit’ analyzes your dog’s DNA and identifies the breeds in its ancestry and its dominant characteristics. So you see, you can definitely go bonkers if you choose to pamper your pet. Well, if you want your pet to accompany you on the flight or cruise to your dream vacation, do it in style with Pet Wheel-away or a more stylish and expensive ‘Lambskin Leather Pet Carrier’ - all the better if you have groomed your pet with the ‘Pet Styling System’ available for in-home grooming! This brings to mind the news “Oscar’s world woof tour” about which I had read in RD (April 2010).Accompanying his owner Joanne Lefson who funded this epic journey by selling off her home, this globe-trotting pooch with passport in paw, during his 220 day tour across 29 countries of five continents had stopovers at “some of the world’s most famous landmarks – from the Pyramids of Egypt to New York’s Statue of Liberty” to “publicize the plight of the world’s strays.” What takes the cake is the tidbit – “The proud pooch and his owner even got “married” in Las Vegas – vowing to promote the adoption of shelter dogs till death do them part”! After all this it’s not impossible for you to imagine that pet owners go in for insurance schemes for their pets, right? Guess it is practical wisdom as it will see them through visits to veterinarians. I have seen hired ‘dog walkers’ in TV serials. But we came across a DINK couple who have opted for a pet for obvious reasons seeking a ‘baby sitter’ for their two-month old kitten! I won’t be surprised if I find ‘day care’ for pets during my next visit! Then there is this Awards Show on TV, no not Emmy or Grammy but Fido Awards – for dogs. What next? I bet it’s going to be Reality Shows on TV to showcase pets’ talents – and pray, why not – aren’t they winsome and talented too?! Hm….so it’s not a ‘dog’s life’ for the pets, nay, far from that! Remember their master pays for their comfort and joy and also scoops their poop after them. Didn’t someone say it’s better to be born a pet in America than a human being anywhere! I am one such proud-pet owner! Believe me I did start scribbling about her when I chanced upon your write-up. A coincinde!? My pet does enjoy the special status you mention..... oops will not give it away.